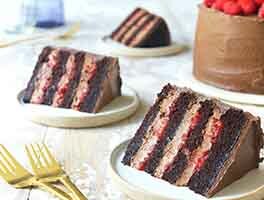 This quadruple-layer cake isn't nearly as fussy to make as you might think. It starts out as a standard two-layer cake, then each layer is cut in half and stacked, with an easy filling in between the layers. The result is a moist cake that keeps well without refrigeration; looks spectacular when cut, and tastes even better than it looks! Want to make 2 dozen cupcakes instead of a layer cake? 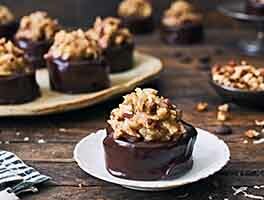 Enjoy our recipe for Favorite Fudge Birthday Cupcakes with 7-Minute Icing. 35 mins. to 38 mins. *Hint: Since you need 4 ounces of cream for the icing, and you'll most likely buy an 8-ounce container, use 4 ounces cream in the filling supplemented with 2 ounces of milk. Preheat the oven to 350°F. Lightly grease and flour (or grease, then line with parchment, then grease again) two 8" x 2" round cake pans. Note: These pans need to be at least 2" tall; if you have non-standard, shorter 8" pans, substitute 9" round pans. To make the cake: Whisk together the dry ingredients. Add the eggs, oil, vanilla, and water, beating until smooth. Pour the batter into the prepared pans. Bake the cakes for 35 to 38 minutes (a bit less if you use a 9" pan), or until a cake tester inserted into the center comes out clean. Cool the cakes in the pan for 15 minutes, then turn them out of the pans to cool completely on a rack. To make the filling: Combine the chocolate and cream in a microwave-safe bowl, and heat until the cream is very hot, and the chocolate very soft. Stir to melt the chocolate completely, reheating very briefly if necessary. Now you have a choice. You may either flavor the filling all one flavor, or use a different flavor for each layer of filling. For all one flavor, use 3 tablespoons of your favorite liqueur — Frangelico (hazelnut), Kahlua (coffee), or Framboise (raspberry) are all good choices. Or try 2 tablespoons rum. 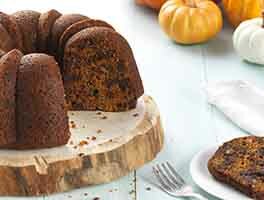 Alternatively, add 1 tablespoon espresso powder; or flavor to taste with a bottled extract (coconut, peppermint, cherry, almond...) To mix and match flavors, divide the filling into three parts, and flavor each differently to taste, with an extract; or with about 1 tablespoon liqueur for each flavor. Divide the cooled layers in half horizontally, to make four layers. Place one layer on a serving plate, and spread with filling. Repeat with the next two layers. Top with the final cake layer. To make the icing: Combine the chocolate and cream in a microwave-safe bowl, and heat until the cream is very hot, and the chocolate very soft. Stir to melt the chocolate completely, reheating very briefly if necessary. Pour and spread the icing over the top of the cake, letting it drip over the edges and down the sides. Once it's done dripping, you may smooth the sides with an icing spatula, if desired. 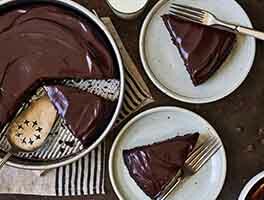 Allow the cake to rest, covered with a cake cover (or a big turned-over bowl) until the chocolate is set; overnight is good, though several hours are sufficient. This cake rocked!! So fudgey! I added a whipped cream layer between the second and third layer and it turned out great! Highly recommend! Tastes good, however, the filling is more like a liquid and is not particularly sturdy enough to create a "filling" inside the cake. The icing that is poured over the top of the cake is the same ratio as the filling so you can see how the filling is drippy. Maybe I misunderstood how much "body" the filling was supposed to have. Perhaps if you let the filling sit in the fridge overnight it would be more fudge-like but that could be written into the recipe is that is the intended consistency. I really enjoy this cake, and seriously recommend it anyone who is use to making box mix cakes, or just doesn't like the longer process of have to cream the butter and sugar. It's a good way to get your foot into the baking world. I know how to bake, but wanted something quick and tasty. This worked out perfectly. The cake is sturdy enough to cut layers, but also moist. For the filling, I wouldn't bother cooling the filling, as the warm ganache soaks into the cake layers a little, adding the the fudgy texture. Just be careful when stacking the layers so you dont squish it out of the layers. Next time I probably will cool the ganache for the outside of the cake, as it was a little hard to control when warm, and wanted to pool on the bottom of the sides, but I kind of expected that. Overall a pretty decent cake. This was my first attempt at making a chocolate fudge layer cake. The instructions were easy to follow but I'm very happy I read the reviews and saw that the filling needed to completely cool before using, that was a great tip. 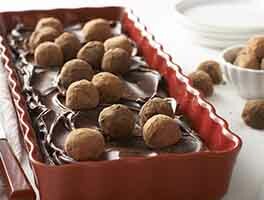 I highly recommend this recipe for any chocolate lovers for any occasion. I made half a batch and got exactly 12 cupcakes from the batter. They were super delicious. If you are looking for Dutch process cocoa in the grocery store, simply look at the ingredient list. The Dutch process ones with have the ingredients alkali and cocoa. It was not otherwise obvious which ones were dutch (versus natural). Made this for my son's birthday. Made it the day before so everything would be well set up. Remember to let the filling cool a bit before spreading. We just used vanilla for the flavor in the filling. It was a big hit. I made this tonight for my daughter's birthday and it came out great! I used chocolate buttercream on the inside and Ganache on the outside frosting. I had some doming on my cake so I had to trim two of the layers (prob due to uneven temperatures in my old not so great oven) but still came out great! Nom nom nom. Made this in a heart shape for my mom's birthday yesterday. Delicioso. 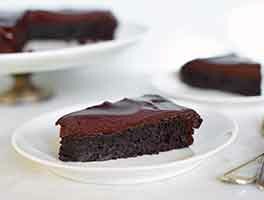 This cake has a rich dark chocolate flavor. The cake didn't look perfect like the one in the photo, but that was because of my amateur baking skills and not because of the recipe. I baked in 9 inch pans (didn't have 8 inch) and the cake was done at 30 mins. I added rum to the filling, which was delicious and not an overpowering flavor! Like the previous reviewer, I had enough of the filling to ice the cake with a thin layer, so did not have to make extra ganache. Saved the extra chocolate for my next cake. :) Instead of espresso powder I used some finely ground coffee. Any tips for preventing doming while baking? I can't seem to get perfectly flat cake layers. I made this recipe for my husband for Valentine's Day today. I used the rectangular celebration pans. Perfect. I only made the filling and used raspberry schnapps. There was plenty of filling for the three layers plus the top and sides so I did not make extra ganache. The filling set up perfectly. I just let it sit at room temperature for about 20 minutes before putting it on the cake layers. Now two hours later, it is fully set. Beautiful! Will definitely be making this again and again. Serving with fresh raspberries and powdered sugar. This recipe will not work UNLESS YOU COOL/CHILL the filling. Step 4 should read "To make the filling: Combine the chocolate and cream in a microwave-safe bowl, and heat until the cream is very hot, and the chocolate very soft. Stir to melt the chocolate completely, THEN, COOL UNTIL THE CONSISTENCY OF FROSTING. . . reheating very briefly if necessary." I looked at the positive reviews and saw that people claimed how great the cake was when the directions were followed exactly. So, I thought it was just me when, after cooling the liquidy filling for 15 minutes, it ran off the sides of the layers. Furthermore, when I placed the next layer on top, what was there was pushed out. So I called the baker's hotline and explained the situation. I was informed that I needed to cool it more. I asked that the recipe be corrected and was told that she would pass that along. So as I wait for the filling to cool further, I just checked the worst reviews and see that in 2016 (or 2015?) a reviewer indicated that the filling needed to be chilled for the recipe to work. I am very disappointed in KAF for not correcting this recipe earlier and thus causing my cake to fail. I am taking it to a gathering tomorrow and will be embarrassed by it. I expect more from this company which I have supported for many many years. I thought I could trust their recipes.